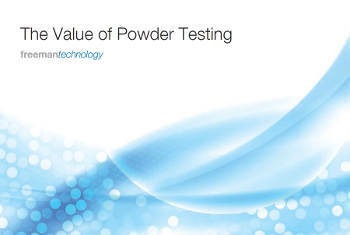 Freeman Technology, a global leader in powder characterisation, has published ‘The Value of Powder Testing’, the third in the company’s series of educational guides on powder characterisation for industrial applications. The new booklet focuses on how to assess the economic benefits that a powder tester can deliver and explains how these may vary considerably depending on the instrumentation selected. All three guides, including, ‘An Introduction to Powders’ and ‘Choosing a Powder Tester’, are written in an easy to understand, straightforward style and are now available for download at: www.freemantech.co.uk/_ebook/. The new guide addresses key questions associated with an investment in a powder tester. These include: What makes powder test data valuable? How does powder testing deliver an economic return? And, how can I identify ways in which powder testing might deliver value for a specific process or R&D laboratory? Example studies show how to estimate potential gains. The aim is to survey the ways in which a powder tester might pay back its initial costs, and examine the attributes of particular instruments and/or techniques that make this more or less likely. Visit www.freemantech.co.uk to download your complimentary copy of the new guide.